If you need a sewer repair, you want the best company around to be on the job. At GR Plumbing, we provide value through unbeatable experience, a large inventory (so you don't have to wait forever for parts to arrive), high quality parts, and a large team of qualified plumbers to handle projects of any size. In addition, we engineer extra value for our customers by providing alternate materials when it is reasonable in order to lower the overall cost of the project. Therefore, if you are in need of sewer repair or replacement, we are the contractor for you - we will inspect, repair, replace, and clean up your sewer with the utmost professionalism and knowledge. 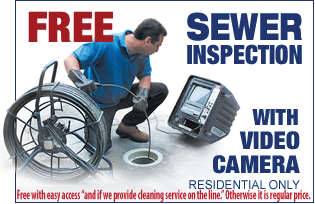 We even do video inspection by inserting a camera into the sewer line and checking its condition. While the inspector (camera operator) will perform the bulk of the analysis in real time, we will always save the video recording for later review. Other contractors often times will not provide a recording, so they can't review it later and you're stuck wondering what the real problem is or if they're being truthful. We have been proudly offering quality and friendly service from reliable professionals since 1990. Two and a half decades ago, it started with just two people, but customer demand and a commitment to excellent results has allowed us to expand our operation to over 30 employees in California and fulfill our role as a plumbing contractor that focuses on residential, commercial, and public services. In addition to sewer repair, we also help with water heaters, furnaces, pipe leaks, sprinkler systems, and more. If you have any questions, feel free to get in touch and one of our professional, friendly, representatives, who will gladly any questions you might have. Also keep in mind that we offer emergency service 24 hours a day. That's right, whether you need a quick inspection, repair, or other service, we have the capacity and reasonable prices to make it happen. We at GR Plumbing are dedicated to offering you the very best service in the most professional manner. Give us a call today at 310-409-4709!